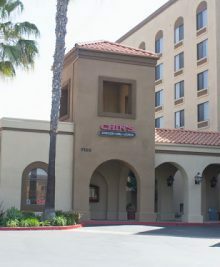 Marion Crepes is currently in San Diego at the Mitsuwa marketplace. They will be there until April 27. 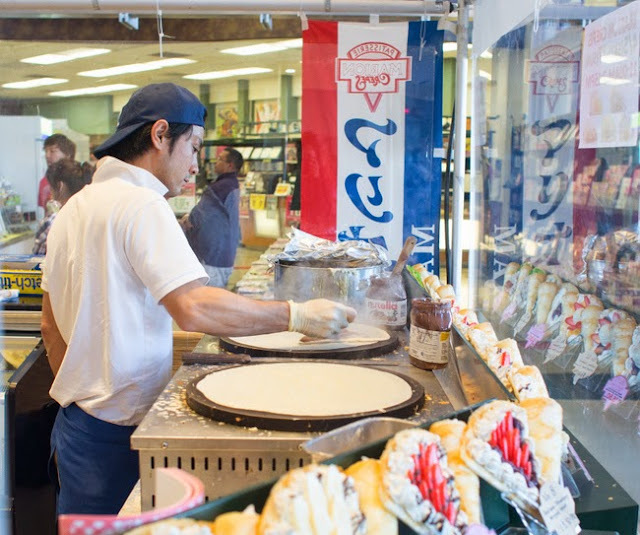 Marion Crepes, which is from Japan, sets up a booth inside various Mitsuwa locations a few times a year. 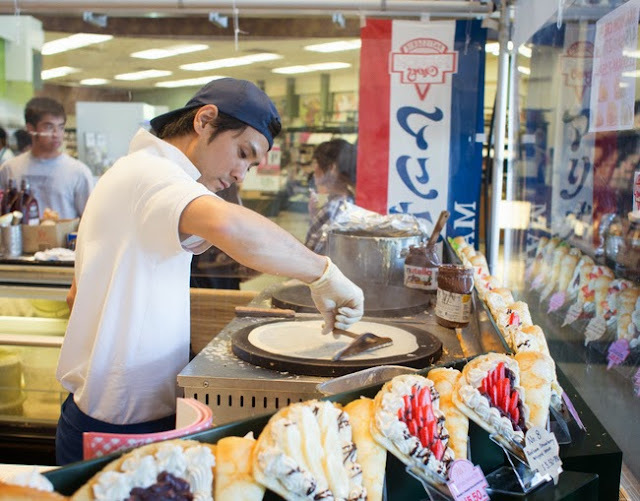 The make harajuku-style crepes, which are very popular in Japan. 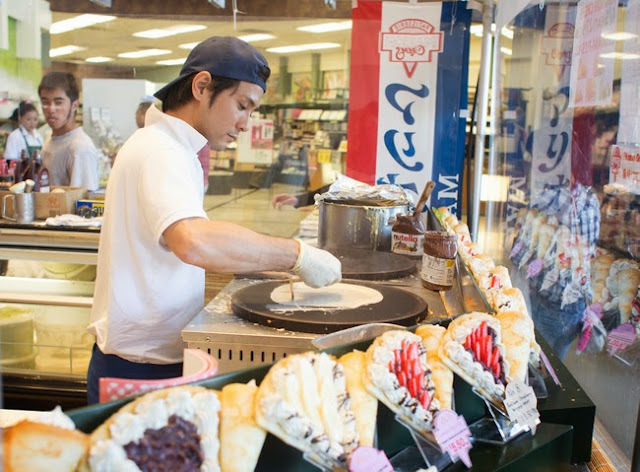 The thin crepes use a rice flour, giving them a slightly chewy texture. 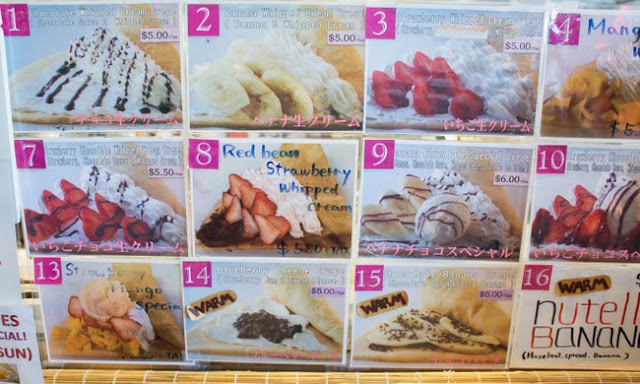 They are filled with fruits, ice cream, whipped cream, etc and eaten like an ice cream cone. 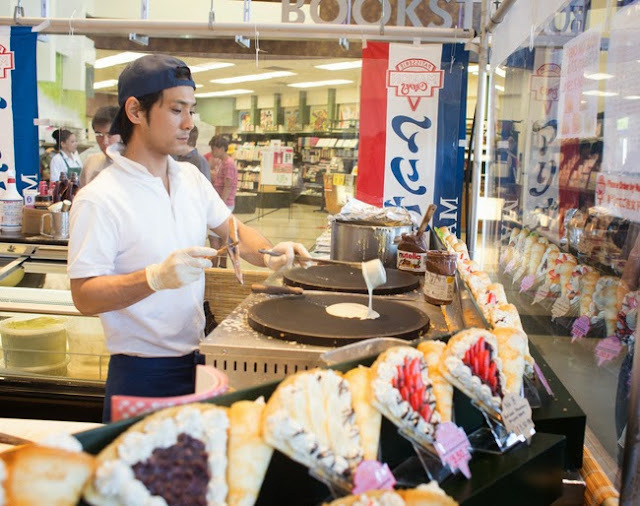 I’ve had harajuku-style crepes a few times. 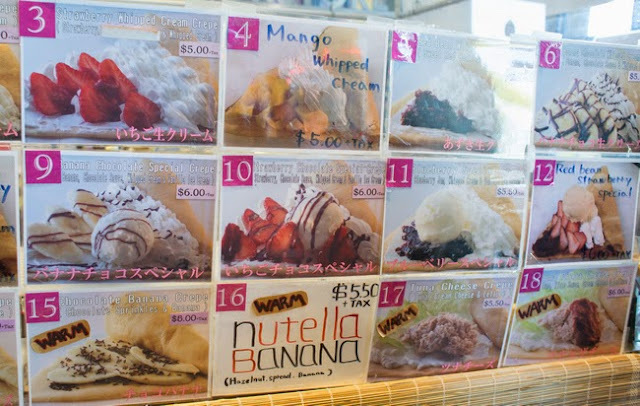 My favorite place to get them is at Harajuku Crepe in Los Angeles. 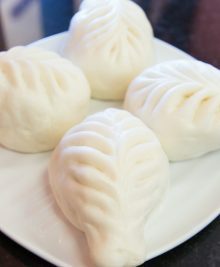 Angels & Hearts in San Diego also makes them but I’m not fond of the texture or the very small amount of filling. 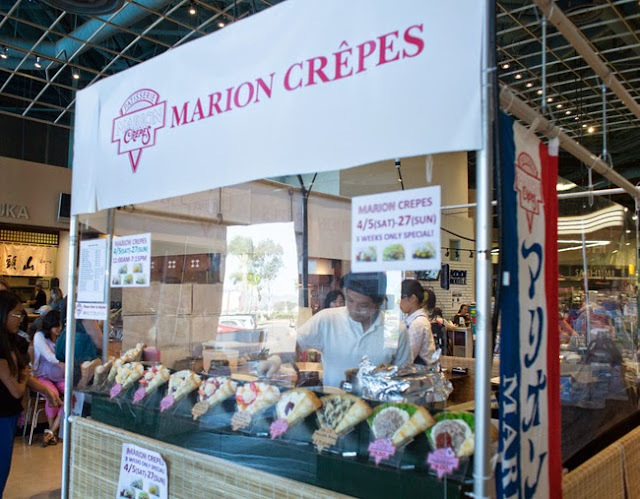 We actually had Marion Crepes when they were at the Costa Mesa Mitsuwa last year. I didn’t have a great experience because instead of making the crepes fresh, they were just taking out pre-made frozen ones. However, I noticed this time that they were making them on the spot, so we decided to try again. 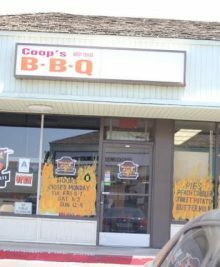 The menu contains about 18 different options, including a few savory ones. I noticed some are labeled “warm” and so I decided to order one of those to ensure a freshly made warm crepe. The line was quite long, but luckily the crepes cook quite quickly. We didn’t have to wait too long. We chose a warm chocolate banana crepe. 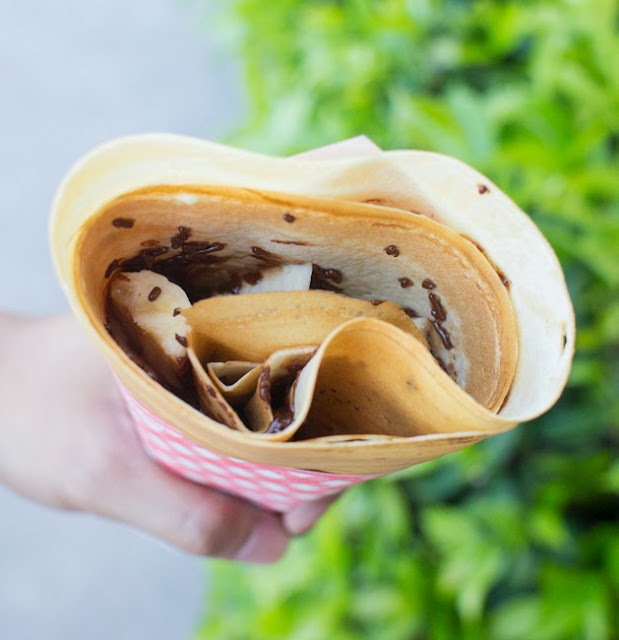 The crepe was warm, crispy around the edges, and thin with a slight chew on the inside. There was a good amount of banana and chocolate filling. We enjoyed this crepe much more than our first experience with Marion. 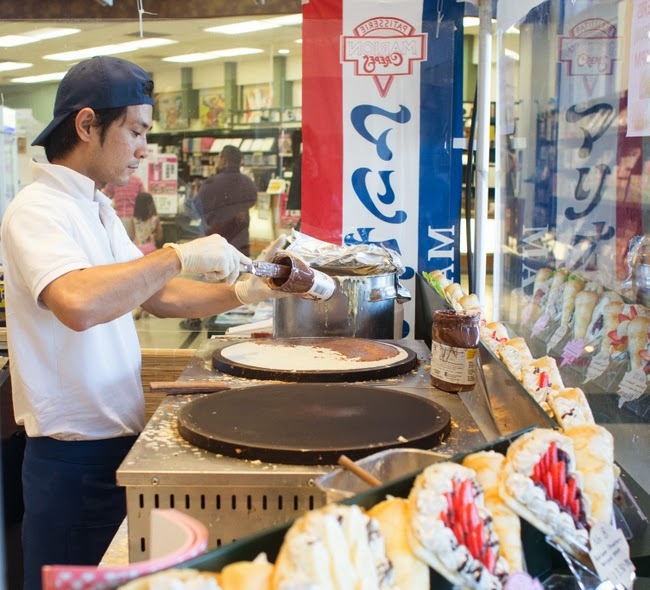 I still think Harajuku Crepe in LA store makes the best harajuku crepes I’ve experienced, but Marion’s was a decent version and better than Angels & Hearts in my opinion. As I mentioned above, they will be in San Diego until April 27th, so hurry if you want to try it. They are set up in a booth right inside the entrance of Mitsuwa. haha, yup! Now you can do both at once. I need to go back to Matcha love. I’ve been craving their soft serve all week especially since it was so hot! It has a slightly chewier texture from the rice flour. Nutella one looks yummy! Wow, they are early this year. Last year Cathy blogged about them in late June and their last day was mid-July. They did fresh crepe instead of frozen. I would have been mad if they gave me a pre-made one. I like that your crepes were pretty generous in size and with fillings! Yeah I was pretty pissed with the frozen ones we got at Costa Mesa…But this one was better. I do wish they had more topping choices like ice cream! And it’d be nice if you could build your own fillings instead of having to choose a preselected one. 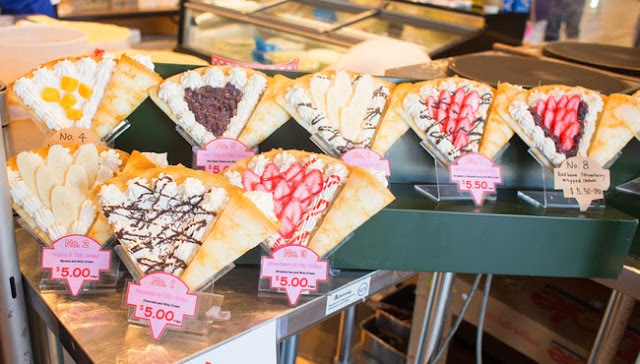 Hi Kirbie – I think you can kind of customize your crepes here, since they have a toppings list you can add to your crepe (50 cents for most toppings, and 1 dollar for ice cream). I had the strawberry azuki bean paste with green tea ice cream – the green tea ice cream just made me crave the matcha ice cream from Matcha Love! 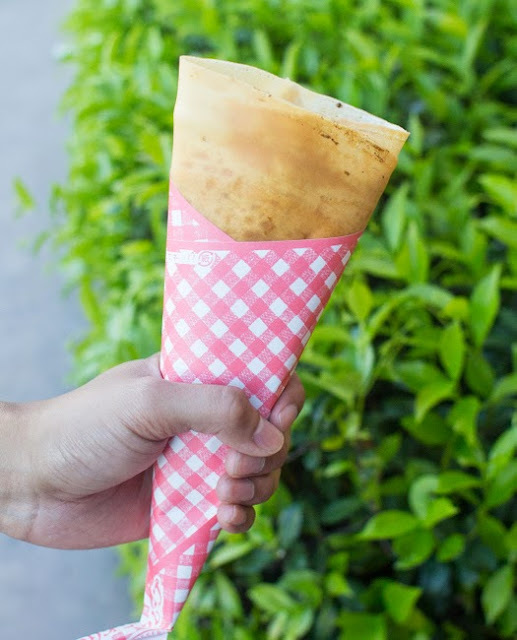 I really want to get a crepe and then go over to Matcha Love and get a cup of softserve to spoon into the crepe. I actually thought they were just ok – definitely need to try the Harajuku one you’re praising. Oh I didn’t see the option to customize! thanks for letting me know. I also wish they could do some joint collab with Matcha Love so I could put the soft serve on mine! I thought the crepes here were just okay too. The one in LA is a lot better IMHO, so I hope you get a chance to check it out!